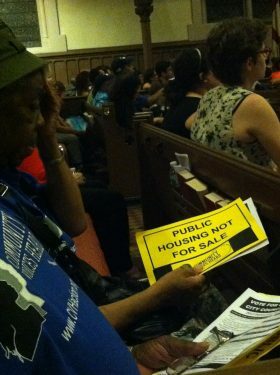 If you missed last night’s NYC Mayoral Forum on Affordable Housing, don’t worry: this was one you could afford to miss. Even Adolfo Carrion, the first candidate to roll into the swealtering Calvary/St. George’s Church, didn’t show up until half an hour after the appointed start time. He was followed by Bill de Blasio and Bill Thompson. Anthony Weiner walked in during the forum’s “lightning round” of questioning, claiming that he had been held up by his son getting burnt by hot tea. John Liu was last to show, but also last to leave. The idea was for the mayoral candidates to offer their views on every NYC resident’s favorite subject: affordable housing. But for the most part each candidate ended up emphatically agreeing to everything brought to the table without having a single contrary thing to say. Such is the way of the pre-mayor mayor. During his opening statements, Thompson made an interesting slip of the tongue. “You are the ones who failed to give up on [living in] NYC,” he said, having meant to say “refused to give up living in NYC.” The gaffe stuck in my mind: given that hardly anyone can afford to live here anymore, the wiser of us have most likely jumped ship a long time ago. Thompson went on to say that making changes to a long history of problems with housing affordability in New York does take time, but that with each year he spends involved in city issues, he realizes that one year, five years, even thirty years go by in the blink of an eye, and that if change doesn’t start now, it will never happen. Will one of these candidates be the one to make these changes? It’s hard to say. All that was heard was “yes, yes, yes,” accompanied by thumbs up and plastic grins. 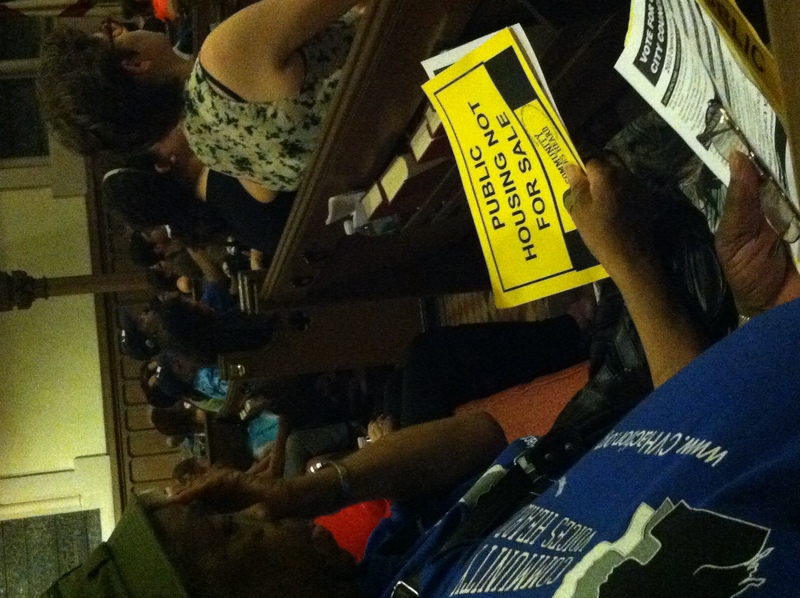 All of the candidates, for instance, said they were in favor of the New York City Housing Authority’s plan to lease some of its East Village and Lower East Side parking lots and playgrounds to private developers. Asked whether the units would remain affordable 30 years from now, the mayoral hopefuls said they’d make sure they stayed so forever. They also said they’d strive to prevent situations such as the one in Greenpoint, where, according to protesters, only 19 of 1,345 affordable units promised by the city in 2005 have been built. Whoever the winning candidate ends up being, when they say X amount of affordable housing units will be built, they will actually be built. Only time will tell if any of these candidates — not to mention Christine Quinn, who didn’t show — will do anything differently, or hold to any of the promises that wrung from their suits like sweat from a dirty sponge. Of course, there’s always this guy.